For over 30 years our background has been manufacturing and wholesaling quality furniture throughout the country to major furniture retailers. In 2004 we started a new division to our company, to supply large cabinet manufacturers with premium quality dovetailed drawer boxes. This quickly turned into demand for high end custom cabinetry that we could produce for significantly less than other manufacturers, and so was born Cabinet Wholesalers. Our goal was not only to produce the finest custom cabinetry, but to also completely change and simplify the ordering process. Gone are the days of “up-charges” for every little option and feature. With our “All Inclusive” Signature Line of custom cabinets, for one low price you have your pick of door styles, colors, crown mouldings, hardware, decorative features, glass, and even the configuration. The cabinets already come loaded with an enormous assortment of high end features at no extra charge, and great attention is given to every detail. Our price even includes professional design and installation! Now our story gets even better in that we not only produce the very best in cabinetry and sell it “All Inclusive”, but for comparable cabinets, we can save you significant money, up to 60%. We can also reface your existing cabinets and save you even more money! Because our Signature Line of cabinets only uses the finest materials, finishes, hardware, and construction techniques, we are proud to offer a 20 year warranty. We are licensed (931469), bonded, insured, and Better Business Bureau A+ rated. We are continuing to add new programs so that we can say “YES” to everyone and meet a broad spectrum of needs and price points. If you are looking for Premium Quality Custom Cabinetry and you want to save money, then please visit our showroom so that you can see for yourself the quality difference and the simplicity in purchasing custom cabinetry from Cabinet Wholesalers, or call (714)693-1111 for a free estimate. All of us at Cabinet Wholesalers would like to Thank You for the opportunity of earning your business. This is our history. 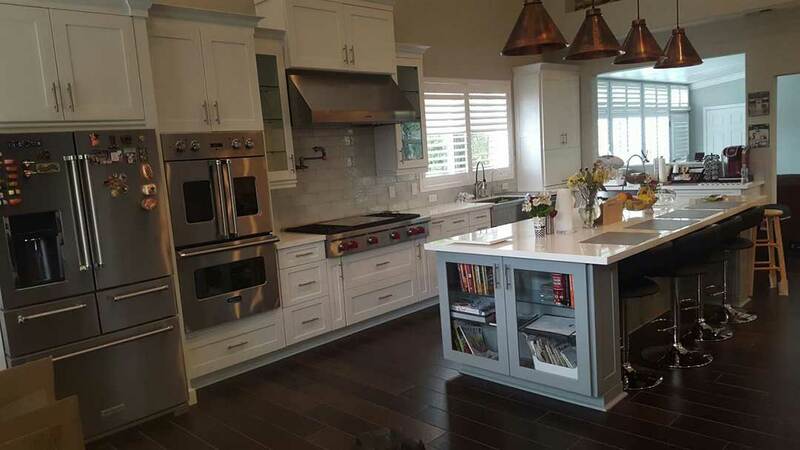 One phone call to Cabinet Wholesalers was all it took to launch our kitchen remodel project. Eirik and Scott took our basic ideas and showed us how we could transform our ordinary kitchen into something truly custom. All our new cabinets are really beautiful. We especially love the matching media niche in the adjacent family room. They delivered in less time than we originally expected. The installation team was neat, professional and dependable. We got much more than we ever thought we could afford through Cabinet Wholesalers.